Dimensions 1.10 by 5.50 by 8.37 in. 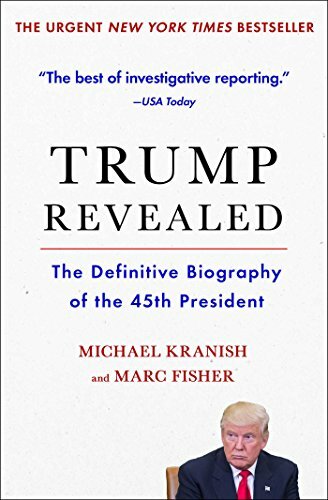 Hailed as âauthoritativeâ and âessential,â and based on the work of two dozen reporters and twenty hours of interviews with Trump, Trump Revealed is the indispensable and now updated biography of the 45th president of the United States. Who is Donald J. Trump? To discover Trump in full, the Washington Post assembled a team of award-winning reporters and researchers to investigate every aspect of his life, from his privileged upbringing in Queens to his hundreds of lawsuits, his infamous womanizing, his shifting position on abortion rights, his dizzying seven changes in party affiliation, and his astonishing, disruptive election as president in November 2016. Coauthored by Washington Post investigative political reporter Michael Kranish and senior editor Marc Fisher, Trump Revealed details the 1970s Justice Department suit against Trump and his father for racial discrimination, his business and political machinations and alleged organized crime connections, his disastrous Atlantic City casino projects, and his relentless pursuit of the attentions of the media. What emerges is a portrait of âa man certain of his views, hugely confident in his abilities, not terribly well informed, quick to take offense,â a man with a penchant for big betsâon real estate, branded businesses, and, ultimately, on himself. In the wake of the most controversial and polarizing election in modern American history, Trump Revealed provides essential insight into this billionaire businessman, celebrity, and global brand who is now the president of the United States.